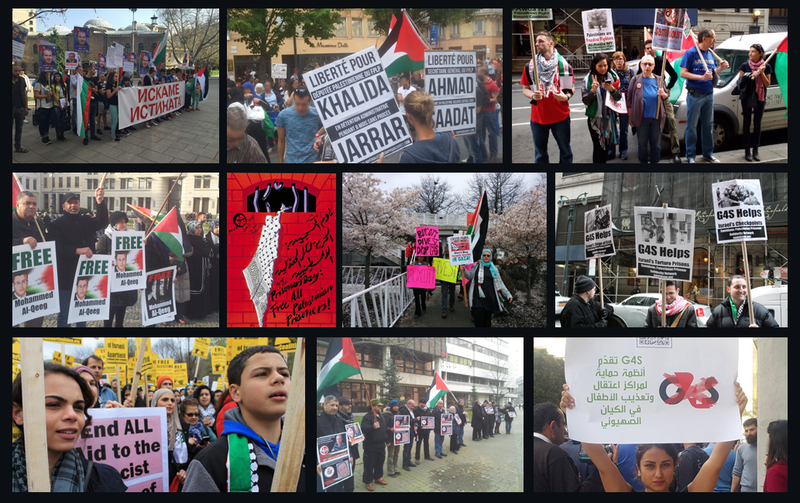 « Manchester: Rolling picket for Palestine – Free Ahmad Sa’adat! Nottingham Revolutionary Communist Group is joining the international week of action called by Samidoun Palestinian Prisoner Solidarity Network to Free the Political Prisoner Ahmad Sa’adat and all political prisoners. On Saturday 19 January, Join us in a collective call for the freedom of Ahmad Sa’adat and all Palestinian Prisoners. Join us to demand an end to British support for the Israeli occupation that has been confiscating land and lives for over 70 years. Join us outside Marks & Spencer, Britain’s biggest corporate sponsor of the Zionist Israeli state and a symbol of Britain’s support for Israel. Freedom for all political prisoners! Freedom for Palestine! Victory to the Intifada! This will be an anti-racist protest – all anti-racist groups and individuals are welcome to join us and bring your own placards/ literature or borrow some we have prepared. We will have an open microphone so please feel free to prepare something to say. If you would like to learn more about the situation in Palestine and in particular the situation for prisoners, feel free to come along to find out more. Ahmad Sa’adat is a prominent Palestinian national liberation and international left leader, the General Secretary of the Popular Front for the Liberation of Palestine. Britain has been responsible for racist oppression of Palestine for over 100 years- in 1917 the British government issued the Balfour Declaration, which called for “a national home for the Jewish people” in Palestine, despite the huge majority of Palestinians being against this. After decades of British rule, this lead to the ethnic cleansing of 750,000 Palestinians in 1947/8. Today Britain continues to support Israel, militarily, economically and politically– for example, £221m in arms export licenses were issued last year alone. Marks and Spencer is a key British supporter of Israel. Marks and Spencer annually sell approximately £240 million worth of Israeli goods, including grapes, lychees, fresh figs, plums, dates, Hass avocados, fresh herbs, Sweet potatoes, potatoes, red peppers, suits and underwear. M&S stocks goods produced by Israeli companies like Delta – selling a reported 51% of Delta clothing. In 1941 Israel Sieff, M&S Chairman, advocated ethnic cleansing of the Palestinians: ‘large sections of the Arab population of Palestine should be transplanted to Iraq and other Middle Eastern States’ (Jewish Chronicle 21/9/1941). In 1990 Marcus Sieff, M&S Chairman, wrote that M&S sees ‘aiding the economic development of Israel as one of its fundamental objectives’. In 1998 Marks and Spencer CEO Richard Greenbury received the Jubilee Award for services to Israel. In 2004 chief executive Stuart Rose was guest of honour to the British Israeli Chamber of Commerce annual dinner as reward for ongoing support for Israel. In 2014 M&S chiefs attended events in London organised by David Cameron to counter the boycott and to strengthen trade with Israel. We call for the complete boycott of M&S, as a symbol of boycotting British state and corporate support for the vicious Zionist state. Join us.